Time for Writer’s Workshop again! 1.) Baby fever is in the air. Describe what you would do differently as a first time mom. To which I thought, “Yes, baby fever IS in the air!” You see, I have slowly been coming down with baby fever. I know mentally that I am not ready for a baby yet. I need to get healthy first. I need to get off any meds (even though there’s no proven risk in humans, I need to). The hubby and I need to be somewhere comfortable financially (a process I’m helping by leaving my job *cough*). But baby fever cannot be cured by reason. It is especially odd, considering just one year ago there was no way in hell that I wanted a child. I knew I would eventually again. But for the couple of years before that, no way, not happening, no. It was a purely academic knowledge that at some point the prospect would probably be appealing again, and that if I never did I would regret it. Then all of a sudden, my biological clock’s alarm went off, and I can’t find the damn snooze button! So I’m just living with the alarm going off every 10 minutes in my head, just like my cell phone does in the morning for me. It can also be triggered by cute children, like the ones I saw at lunch today. See the second half of that prompt? The part about what would you do differently? I think that means I have to have some experience first. Fooey. So that one’s out. 2.) What book captured your heart? Write about why the first book you loved is the first book you loved. “Is your mama a llama?” I asked my friend Dave. “No, she is not,” is the answer Dave gave. :-) OK, sorry if that’s not letter-perfect, I’m pulling the words out of my head, but it’s pretty dang close! Later loves were The Boxcar Children, a kids mystery series, and Island of the Blue Dolphin, the first book I ever remember claiming as a favorite. And later loves can be found in my giveaway! (Had I mentioned that?) So go check them out and then play along! I thought I knew all the children’s books, but this one we missed. Fun post. That looks like an adorable book, I’ll have to look for it next time at the library!! ooh, must find this llama book. my son would love it! The llama book is a hit with The Dudes too! As for the baby thing, you know, there really never is a perfect time to have one, you can always be healthier, more financially stable, more prepared emotionally, etc., but you will never be ready really. It’s one of those things you can only prepare so much for and then you are still going to be blown to bits by the mini human you birthed. Smart of you, thought for making plans. I had an accidental pregnancy which was scary at first but turns out to have been the best thing that EVER happened to me ever. I thought about writing about baby fever even though I’m in the same boat as you and I don’t have kids. But ever since my niece was born last year babies are all I can think about….but in due time it will happen! I have always loved that book! I mean, the title alone is just the GREATEST! 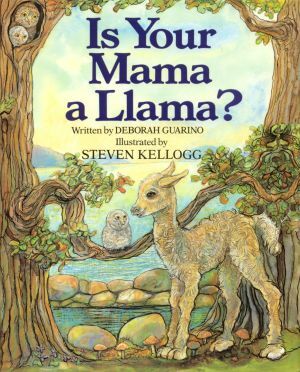 Is your Mama a Llama! What is not to love about a title like that? Fabulous for sure! I did the baby prompt too, and I don’t have kids either. I just wrote about what I WOULD do. haha! I remember that book and the Boxcar Children series mainly from when the son was wild about them. Good books. One of my daughter’s favorite books as well! Oh, and Boxcar Children! Loved that series. P.S. No one is ever ready to have kids! I’m still not, yet here they are, clinging to my leg, preventing me from blogging. Just kidding. Having children is like planning for an all inclusive trip to Hawaii and winding up in Cuba with no passport, to money, and no clue how to speak Spanish. It’s a rude awakening, you feel scared but eventually you find your way to the American Embassy. HA! I love the analogy!! I love box car children. My kids, however, are so taken in by “Diary of a Wimpy Kid” and “Captain Underpants” that I can’t tear them away. Phoey!! I feel the same way about the baby fever thing. I can’t find the stupid snooze button either, as much as I’ve tried. I have similar goals, or a list of things I want before having a baby: to be healthy (or at least healthier), to be mostly out of debt, for my husband to be done his degree, the basement to be renovated, money saved up in the bank… etc, etc. I never read Is Your Mama A Llama, but I read the Boxcar Children several times! Great book!